So, this post is going to be something a little different. As many of you might already know, I like to get to know my clients and their businesses very well during the course of writing for them. It’s how I achieve a unique voice for them and don’t spout the wrong information. Bearing that in mind, I recently took a crash course in Nordic Walking to help understand it a little better for a new client, Janine of 3J Fitness, Nordic Walker extraordinaire. I first met Janine when I visited the Reading Central chapter of BNI, and she was without a doubt the most energetic person in the room. It was her turn to do a 4-minute presentation to the group, and unlike everyone else (who just stood up and talked) she took to walking around the room very quickly with her poles as she spoke – I think she managed around 6 circuits during that time. When I joined the chapter I got to know a little more about Janine and her love of Nordic Walking, to the point where I wanted to give it a go myself. 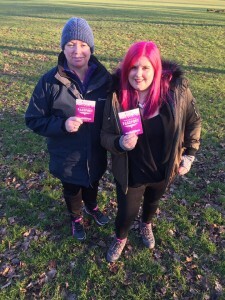 So one cold and grey looking Saturday, I joined Janine and another very bouncy lady called Carla at Prospect Park to find out what all the fuss was about. Before we were allowed to be set loose on the unsuspecting people of the park. 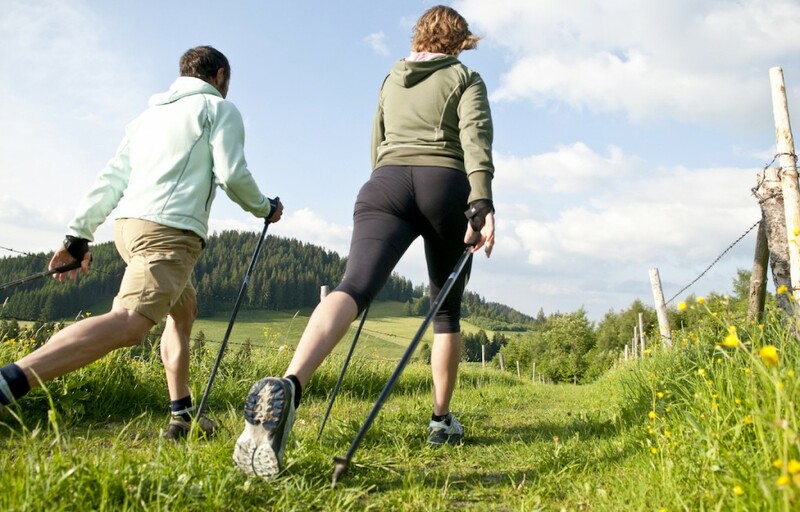 Janine took us through the basics of Nordic Walking. We were kitted out with special pairs of gloves that came with a little piece of plastic, which I soon learned was designed to clip into the poles so you could get the grip right. This was a good thing, as by that point I’d already dropped my poles 4 times! Janine ran us through how to hold the poles properly and how to stand before we were off and learning how to walk again. Turns out, Nordic walking is a lot harder than she makes it look! Getting the rhythm right was the trickiest part for me, as trying to remember which foot to put forward with which arm and when to hit the ground with the pole was almost too much for my sleep-addled brain to process. But thanks to some ‘training’ (which involved Janine walking behind me, holding the ends of my poles and moving my arms for me as I walked) I got there in the end. We spent around 20 minutes on this whole process, and by the end, I felt I could actually walk confidently with the poles. Result! I was then informed that having mastered Gear 1 (basic walking), we were going to learn the other 3. Turns out, there are 4 Gears in Nordic Walking, each a bit tougher than the last. It was at this point that I realised that doing an hour of weight lifting in the gym that morning might not have been the greatest idea! Thankfully, Janine saw the dread on my face and took us through them gently. Gear 1 was the easiest, a nice, steady walking pace using the poles for support and rhythm. Gear 2 moved it up a bit to a faster pace and a firmer motion with the poles moving forward. Janine framed it as ‘punching someone you don’t like in the knackers’, as opposed to the ‘reaching for a handshake’ motion in Gear 1. Cue some hysterical laughter. After we’d recovered and got the hang of that, we tried out Gear 3, which mainly involved changing the position of the poles to give forward propulsion. It still felt like normal walking, but at about 3 times the speed without any extra effort. I loved it! after a few laps and a hike up a hill in Gear 3, we fell apart a bit at Gear 4, otherwise known as running with poles. There was lots of getting confused with the rhythm, hopping around trying to switch your feet and some very funny frog like jumping that I’m still sure was Janine just trying to make us look silly. But by the end, we were panting slightly having run around a mile – a great improvement on my usual running, which consists of flapping around for 5 minutes before falling over in a gasping heap. Now that we had mastered the Gears, it was time to put it all in practice. To finish off the fast track session, we took a rather beautiful turn around the park. Now if you’ve never been, Prospect Park isn’t some tiny little field. It’s a huge expanse of grass, playgrounds and tennis courts, and we spent around 30 minutes just walking around it. It was a refreshing walk full of kicking leaves and some rather rude comments from a dad in the park about pole dancing (though I think he was just curious). This countryside jaunt was apparently quite typical of the kinds of Nordic Walks Janine runs on a regular basis, full of ladies and gentlemen who love to take in the scenery and have a good natter. We finished up with some stretches and we were even presented with our freedom passports – which was very exciting! Through all of this, I didn’t really feel like I’d done a ‘workout’ in the traditional sense. At least, that was until I sat down in the car and my whole body protested. Turns out, I’d been working quite hard while I was frolicking in the field! And to be honest, I think that’s typical of sessions with Janine. She makes walking so much fun that you don’t notice just how hard your body is working. I could imagine getting very fit by accident doing this regularly. Overall, I loved trying out the fast track session with Janine and 3J Fitness, and I don’t think I’m the only one. Looking at all the photos on her Facebook page from her walks, smiles are a regular occurrence! If you’ve never tried it before, go along to a taster session and try the pole-walking experience for yourself!